Although the Boone Central boys basketball team finished 2009-10 with a disappointing 8-13 record, in the end the Cardinals were able to hold their heads high for a season of determined effort. The campaign closed Tuesday, Feb. 23, with a 51-39 loss to Columbus Scotus in the C1-7 Sub-District tournament – a game Boone Central coaches felt was a microcosm of the season as a whole. 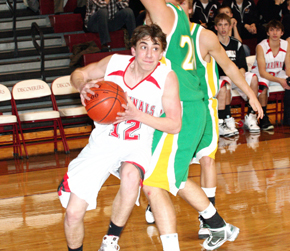 Indeed, offensive points – the Cards’ biggest shortcoming during ‘09-10 play – were again hard to come by vs. Scotus as Boone Central sank just 13-of-34 2-point field goal attempts (38%), 2-of-9 3-point tries (22%) and 7-of-14 free throws. Scotus, meanwhile, came out on fire in the opening quarter, scoring 18 points and taking a 9-point lead that was very nearly the final difference in the contest. The Shamrocks got a trio of 3-point fields in the period, including two by Aaron Bos. Boone Central got untracked in the second quarter, led by Trey Sorell’s six points, but as the Cards defended the perimeter, 6-foot-6 Scotus center Trace Murray shook loose for seven points in the paint to spark the ‘Rocks to a 30-23 halftime advantage. Similar to the opening eight minutes, Scotus began the second half with another long-range blitz and used a 14-7 run to take a commanding 44-30 lead. Shawn Schumacher nailed two-3-pointers in the third period for Scotus and Brady VanCura one. Alex Kuta and Schumacher combined to knock down six free throws in the final stanza, helping the Shamrocks secure the victory. The difference in the final contest of 2009-10 basically came down to 3-point and free throw shooting. Scotus sank seven more foul shots than the Cardinals and made five more 3-point field goals – an overall edge of 22 points. Fundamentally, Boone Central played a solid game, outrebounding the Shamrocks by six (32-26), committing only 10 turnovers and assisting on 11 of 15 baskets. Liss and Sorell led Card scoring with nine and eight points, respectively. Sorell, Dustin Christo and Nathan Olson all grabbed six rebounds and Olson finished with three assists.